thickcrust.com: Are you shitting (in) me? Today I went to use the toilet in the office where I was working and was very dismayed to see a hole in the ground. It wasn't the hole in the ground that was distressing, it was the lack of toilet paper. There was a bucket of water and a faucet in the stall but no toilet paper. I stood in the stall for a minute staring at the hole, trying to figure out how to use it. The only thing I could think of is that you wipe with your hand and then try to wash it off, but that just didn't seem possible. I wasn't willing to risk being wrong on this one. I would just wait until I returned to my hotel. When I returned to my hotel the first thing I did - the second thing, actually - was to search the internet for an explanation of the toilet. 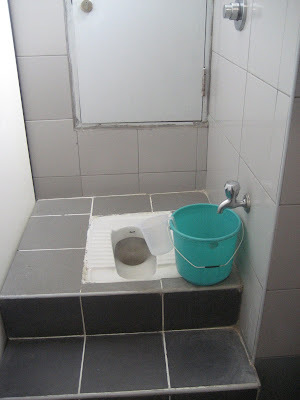 I found this web site that illustrates how to use an Indian toilet.